Things must be seriously blooming, because pollen counts are high across the U.S. right now. Everyone I know is sniffling, sneezing, and suffering. Even folks who aren’t allergy prone seem to be getting hit this year, and you can count me among those numbers. It’s easy to grab some nasal spray or an over the counter allergy medication when hay fever sets in, but that’s not a long term solution. Your body builds a tolerance to these chemical quick fixes, and over time you have to either up your dose or cope with symptoms once again. This part is pretty simple. You’re basically using a very diluted saline solution to flush the gunk out of your sinuses. Water flows into one nostril, through your nasal cavity, and out the other nostril. This sounds a lot more uncomfortable than it is. If you get your technique down pat, you barely feel anything at all. The tips below will definitely help make it a more pleasant experience! You want the water you’re using to be lukewarm. 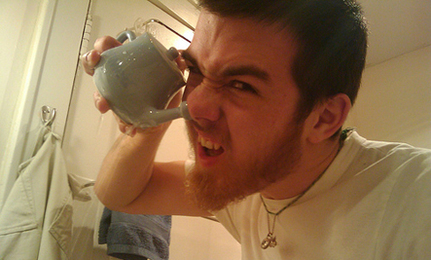 If it’s too cold or too hot, the Neti pot experience is a little less pleasant. A lot of Neti pots come with packets and instructions for creating the saline mixture. If yours doesn’t, just combine a pint of water with a teaspoon of salt and 1/2 teaspoon of baking soda. A pint of water should be enough to irrigate both nostrils, and the baking soda helps balance the mixture’s pH, so it’s easier on your nasal passages. You flush each nostril separately, using half the pint on each side. Good technique is key to a pleasant Neti pot experience! It seems a little bit awkward at first, but remember: the worst thing that can happen is a little water goes up your nose, just like when you were a kid and swimming for the first time. No sweat! Some folks recommend standing or sitting in the bathtub, but the sink works fine, too. To start, place the spout of the pot into your nostril. Bend over a bit at the waist, then tilt your head to about a 45 degree angle. The idea is to get one nostril over the other, where the one on top has the spout in it. You’ll also want to tilt your head forward slightly to help keep water from going up your nose. The water should start to flow through at this point, and so try to relax and take deep breaths through your mouth. It’s easy to catch yourself holding your breath, so try to really focus on breathing. Don’t worry if you need to take a break. This will get easier every time you do it! Are there any experienced Neti pot users that want to share some wisdom? We’d love to hear your tips in the comments! Oh, quit whining. Its easy. If you can jump in a pool, or even better, the ocean, you can flush out your sinuses. And the resulting relief is way worth it. I think I'd rather eat slugs than use a neti pot. It makes my eyes water just thinking about it, but thankfully I don't seem to suffer sinus problems as much as the writer. When I'm bunged up I use a tube of Olbas oil but don't just sniff it - use a finger to put the liquid around the inside of each nostril as a quick fix. Instead of a neti pot, I use a squirt bottle which I find much easier to use. Mine is by Nasofree but there are others around. Use lukewarm water with salt and baking soda (you can get little sachets with this but I found I can easy mix it myself) to make it more comfortable. There is a spray you can get in the chemist, ozone friendly. It is called sterimar and is brilliant. Never tried neti pot, I suppose I should, although it looks a bit cumbersome.